Hayate becomes aware that HATSUSHIBA Hisui is the girl he’s heard about who’s in competition with Nagi for the Sanzenin inheritance and is conscious of the scar on her face. Hisui wants to know why Nagi is back in the lead for the inheritance when she had been previously removed. She attempts a pity maneuver, but Mikado isn’t having it, citing Hisui’s greed as the reason he won’t let her inherit anything. 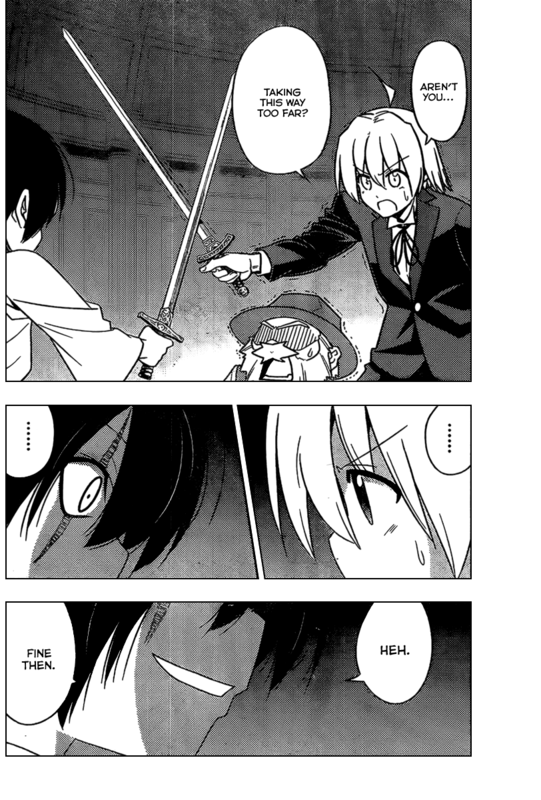 Hisui responds by grabbing a sword and attacking Mikado, but she’s blocked by Hayate. Since Hisui needs the key to be able to sign her name to the will, she and Yozora decide to leave to pursue said key. 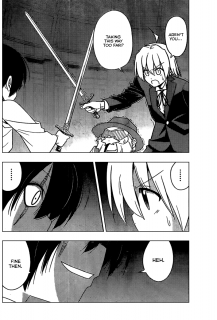 Hayate’s sword is still vibrating from Hisui’s attack, letting him know just how serious Hisui was about killing Mikado. Mikado advises Hayate to be careful since Hisui is so dangerous. 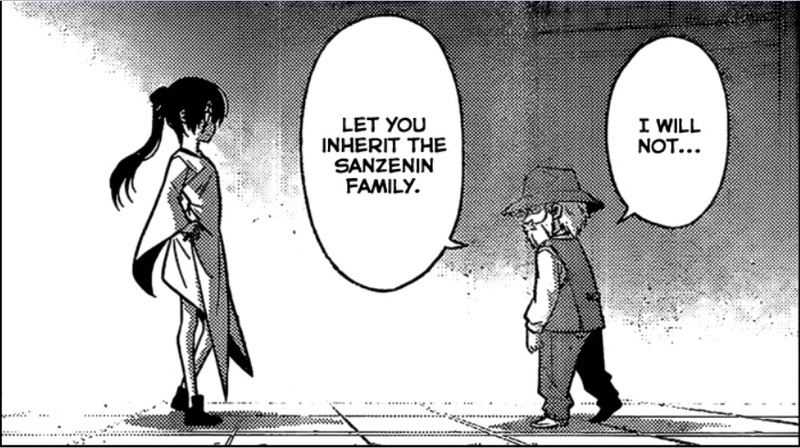 He ranks Hisui on a level of greed along with his parents. When Hayate returns home, Nagi is excited about her manga progress. Hayate decides he will do whatever to protect Nagi’s future, even if it costs him his life. Did Hayate just set a death flag for himself? He may well have. Technically, he did die in the CTMEOY anime, so something similar could happen in the manga. That aside, Hisui has now been established as a final boss-type character. We already know how Yozora is, based on Hayate’s earlier battles with her and how she was able to thwart Isumi. It will take a lot of effort for Hayate to battle these two, and he’s going to need Isumi, Hina, and who knows whomever else to win. I still wish we knew why Mikado didn’t just outright give the inheritance to Nagi. There has to be some catch there, but Hata-sensei is keeping this information from us for the time being. It is interesting to see Mikado in a more serious mode when he gave Hayate advise regarding Hisui. I think he knows that if Nagi is going to inherit the Sanzenin fortune and such, Hayate is going to be the one to do it. The manga’s return to plot has certainly been interesting to be sure. I’m glad this has been the case and hope to continue to see plot for a while to come. This may be the clearest sign we’ve seen that the manga is accelerating towards the end of the line, even if a train car or two gets let go and derails as a result: Hisui would have been a much more effective character if established slowly over time. As it is, she feels so rushed and fits so poorly with the other puzzle pieces that it’s almost reminiscent of a Gecko Ending (as the ill-fated TV Tropes would have called it), like that of Fruits Basket. t’s almost reminiscent of a Gecko Ending (as the ill-fated TV Tropes would have called it), like that of Fruits Basket. What happened with TV Tropes? He, like Wikipedia, suffered a crisis of faith over the fact that many of the editors were nerds, and had nerdy priorities. Wikipedia left the undue amount of nerdy articles (i.e. lists of episode summaries or characters for nerdy TV shows) in place, but discouraged further nerdification and started trimming the nerdiest to smaller/fewer. Fast Eddie led a minority in a charge to remove or Americafy most of the anime tropes (i.e. purging “excess” anime examples from the tropes and turning “Nakama” into “True Companions”), and AFAIK “Tsundere” was the only survivor. Eventually the increasingly-unilateral decisions led to a mass exodus, a competing site, massive arbitrary counterintuitive changes (i.e. making the site less misogynist by doing away with tropes that illustrate misogyny and doing nothing about actual misogyny by the editors), rules enforcement based on your level of ingratiation to the owner, and a slow 4channification of the editor population. The last time I peeked in, they were talking about trying to address it by starting over and redoing the structure of the entire site and database. Ah, one of those “wiki god” things. *_* That’s why I don’t use Wikipedia. When they trashed useful information in anime/manga related articles under the guise of “we aren’t an encyclopedia of all knowledge,” (yes, I was told this), I had had enough. There was an anime wiki site back then that I was trying to help get off the ground. I wrote a piece about that, but sadly, that wiki site is all but dead. Sorry to hear it – it sounds like I passed by in the aftermath, so I wasn’t aware of the culling. I go out of my way to avoid Wikipedia these days as well (even though Google likes throwing it in at the top of most search results, and even though it’s sometimes the most convenient reference for links). Those who share rule over the site (via thousands of little allied fiefdoms) tend to be driven far more by the desire to shape perception than by any desire to benefit the world community, and the rules have cemented their place as untouchable demigods. I agree. But thankfully, there are the Wikia sites for individual series. 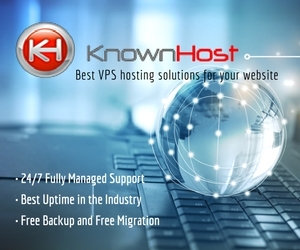 Some are better than others, but the good ones have TONS of great info. Yes, I agree about Hisui she came in after a long time. She does seem the final boss. But like we saw, there is not much depth in her character. She is greedy and wants the inheritance. She is so impulsive that she attacked Mikado when he denied to give her the inheritance; so she is wacky, greedy and uninhibited. And you could do only so much with such a character. Her role came in the final arc. But we were indicated that she is working in the shadows through her maid and keeping an eye and foiling things for Nagi. We need more info on Hisui. We know Nagi knows her and her sister.